This new section is under construction as we assemble a scientifically supported base of information on this topic. Please refer to the link to the EPA website below for a list of pathogens contained in untreated animal manure. Land application of liquid manure is already linked to surface and ground water contamination. Consider the consequences to human health once these pathogens are airborne via spray irrigation techniques. Worst-case conditions that lead to the greatest exposure and risk of infection are nighttime low-wind stable conditions which maximize the inhalation pathway; and high-wind conditions which maximize the deposition and produce ingestion pathway.–from Microbial Risk Assessment and fate and Transport Modeling of Aerosolized Microorganisms at Wastewater Land Application by Idaho Department of Environmental Quality. Margaret L. Pulera, M.D. 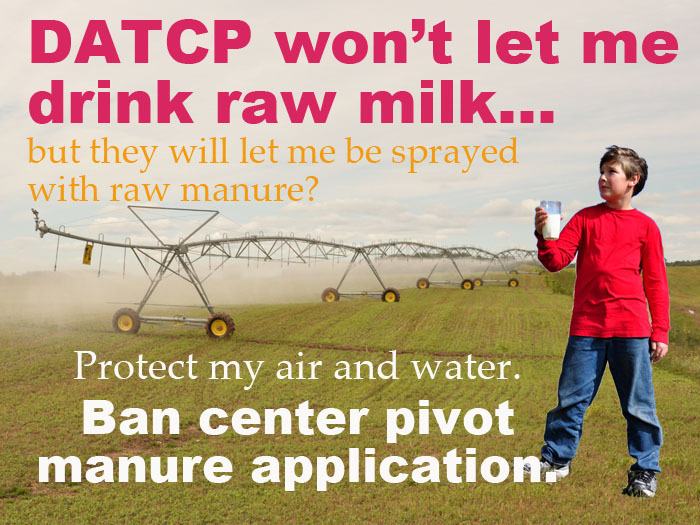 — Using center pivots to dispose of raw, untreated liquid manure is a reckless and dangerous practice. (7) there are hundreds of studies available for review by any interested or concerned citizen that document what I have stated above. Very poor picture and article of how manure is applied in a sprayable application. Fear mongering is for the truly uninformed. To much untreated sewage, 160 known pathogens in this waste along with unknown chemicals, saturated land, air containing poisonous hydrogen sulfide gas and many other noxious gases and water (33+%) of tested wells county wide are now unsafe for human or animal consumption and this is “fear mongering”…who is “uninformed” or performing a pitiful attempt at a “gloss over” of reality!! As the old saying goes: “You can fool some of the people some of the time, most of the people most of the time, but you can’t fool all of the people all of the time”! THE CHILD IS UP WIND FROM THE SPRAYING…..FOR NOW THAT IS….I SEE NO END GUN USE IN THIS APPLICATION….AND I SEE WHAT LOOKS LIKE DROP HOSES….EVERYTHING LOOKS JUST LIKE WHAT YOU TELL US WILL HAPPEN…..WHAT I DONT SEE IS THE DRIFT STOPING AT THE 500 FOOT MARKER…..TELL US HOW YOU ARE GOING TO CONTROL THAT…..? TELL YOUR NEIGHBORS…! JUST A FEW MORE ITEMS……EVEN THE DNR WANTS MANURE TURNED OVER OR INJECTED ASAP WHEN BEING APPLIED TO FIELDS….IT’S ABOUT THE SAFETY OF THE CITIZENS….PROTECTION FROM UNTREATED MANURE….IT’S NOT ABOUT YOUR PROBLEM WITH TOO MUCH COW MANURE….DEAL WITH IT EVEN IF IT COST YOU MORE MONEY….OTHER INDUSTRIES HAVE AND ARE STILL SPENDING PROFITS ON CORRECTING THEIR ERRORS….WHY ARE YOU SPECIAL….? YOU PRIVATIZE THE PROFITS AND SOCIALIZE THE CLEAN UP…..WHAT A NICE DEAL FOR YOU…..! DO YOU IN YOUR HEART BELIEVE THIS IS WHAT IS RIGHT…..REALLY…..? Drift is a reality. What’s in this spray will travel…and it should not be breathed in or ingested. Period. Response to above message…..the farming industry has a proven method of handling manure….one the DNR approves….soil injection…..cover the manure within hours of application….spraying into the air does not make science sense….it does make MONEY SENSE….lets see….more money for me or poison the air….water…..land that my friends live on…….? Believe in the science…..your neighbors are watching and waiting for your decision. cheese factories and other industries. While considered “organic in nature” these wastes are highly pathogenic and toxic. Some operations also take municipal waste from our sewage plants. This mixed toxicity will be aerosolized–reduced into tiny droplets– for the public to breathe in? And the DNR will measure and assess Drift as “droplets felt on ones skin or as seen on your pick-up truck windshield?” Spray irrigation by any other name may be known as “chemical warfare”. Ban spray irrigation of manure NOW–Statewide. Do not allow a Pandemic to be the measure for sounding the alarm on this highly toxic and detrimental form of manure disposal. One dairy cow will produce twenty times the waste per day of a human….so…..with 80,000+ cows in Kewaunee county now that would be equal 1,600,000 people coming into our county everyday and taking a “dump”….then leaving and coming back the very next day and doing it again…..365 days a year…..IT GETS WORSE…YOUR DNR will be sending over 36,000 more cows into KEWAUNEE COUNTY by 2016….this will now equal 2,320,000 people taking a dump on your county….every day….! SOLUTION: Either lower the number of cows….or…..MAKE MORE LAND? Have heard responses from some farmers in Kewaunee county to the effect of “What do you people know about manure ‘disposal’? We’ve been doing it this way for years.” Oh no, you have not. You used to flip manure into the fields to dry and then till into fields, but not on growing crops. We do know what is going on and it isn’t pretty. When you can’t swim at the beaches and the stench of spraying travels for miles along highway 42, you can’t claim that there is no harm done. It is disgusting and pitiful that you think we shouldn’t have anything to say. WE ALL LIVE ON THE WATER and, none of us wish to see you despoil public lands. CAFOs should be immoral for what they do to communities. I live in Humboldt County CA – Part of the time I cannot walk outside as the smell makes me sick… It is not right… Dairies have the right to operate, but I have the right to breathe… When did the “spraying” start. I was raised on a farm, we had manure spreaders, it did not cause the air pollution that the spraying causes.. The CAFO industry is a self monitored corporatized industry not even remotely related to real sustainable farming. It is a deliberate plan to plunder, pollute, and profiteer and to dump the pollution helper skelter onto the land, in the water and now spray or drip irrigation will dissipate raw sewage into the air. This happens because regulatory agencies like the DNR have been defunded, deregulated and made into a dysfunctional and politicized puppet of the CAFO industry. When citizens wake up to what is happening, the industry will declare bankruptcy and move on. Guess who will be left to clean up and pay for the carnage to the environment and to public health & welfare (if restoration is even possible.) With global weather changes rapidly occurring, it is highly probable that the damage inflicted will be irreversible!